Purchase a copy of the current IS-BAO from IBAC, NBAA, CBAA, EBAA, or your local Business Aircraft Association which contains the standards to be met. Train key company personnel on IS-BAO and SMS. Educate all company personnel about the IS-BAO standards and recommended practices. Meet the documentation and procedural requirements of IS-BAO. Conduct a gap assessment / analysis to see how well your organization conforms to the IS-BAO. Integrate additional policies, processes, and procedures to correct those areas found deficient based on the gap analysis to conform with the IS-BAO. Identify hazards and reduce related risks to acceptable levels. 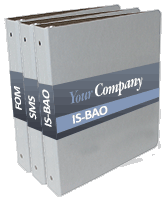 Contact an IBAC accredited auditor to schedule an IS-BAO registration audit. Review your documentation carefully and ensure your personnel are aware of what is expected from them. Once conformity is validated via an IS-BAO registration audit, apply for IS-BAO registration via IBAC. Not sure if your ready yet for a formal IS-BAO registration audit? We can help with a pre-audit Gap Analysis. The purpose of an IS-BAO Gap Analysis is to perform an unofficial “audit” against the requirements of the IS-BAO, designed to acclimate your team to the idea of being “audited” and searching out “gaps” in your current processes, training and documentation. Wilding Air can perform a full IS-BAO Gap Analysis on-site or provide a partial document only based IS-BAO Gap Analysis providing you are able to email us your current, related flight department manuals and documents. Contact us today with your IS-BAO related questions, we’re here to help!